Humanity (ren) in the sense of loving care, goodness, benevolence, is the ethical term that is used most frequently in the Analects of Confucius. Humanity could very well also be the basis today for a fundamental ethic  not only in China, but for humankind as a whole. According to Confucius, humanity is to be understood as mutuality (shu), as mutual respect, as he explains it in the Golden Rule: What you do not wish for yourself, do not do to others. Good and evil can be distinguished by the basic norm of true humanity in a quite elementary way, one that is valid for all. For the Chinese, there is nothing beyond good and evil. Confucius is said to have remarked that there are only two ways: humanity or inhumanity. From left: Taoist priestess; Yue Hai Qing temple, Singapore, Temple of heaven, Beijing.  in an inhuman, antihuman, bestial way, as so often happens. Early Chinese culture, around 5,000 years ago, was a shamanistic culture with a strong religious stamp, at the centre of which stood the veneration of ancestors and respective rites. Also, Heaven (tian) was regarded and worshipped as the Ultimate Reality, the Absolute. 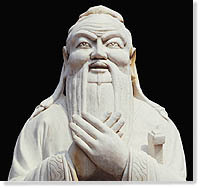 The era of Chinese humanism began in China in the sixth century BC with the emergence of wisdom teachers  the most famous of them was Confucius. There was a transition from magical religion to a rationality centred on human beings and their ethical decisions. To some degree as a counter-movement to that, Taoism arose at that time. It was a return to nature and its harmony, inspired by the wisdom writing Tao Te Ching, which is attributed to the legendary wise man Lao-tsu. This is a philosophical-mystical doctrine of the Tao, the way, the primal law and primal foundation of all being, in which human beings are to be embedded and with which they are to live in harmony. The doctrine of Tao is to a certain extent, similar to the concept of dharma in Hinduism and Buddhism. There are over 1.4 billion Chinese, many of whom are Confucians, Taoists, Buddhists, Christians, Muslims or just free thinkers. However, the trend towards pragmatic syncretism has always been strong among Chinese people, and many of their places of worship contain elements of Confucianism, Taoism and Buddhism. From left: Foretelling from the hand; Morning T'ai-chi meditation in Beijing.